Uh-oh. 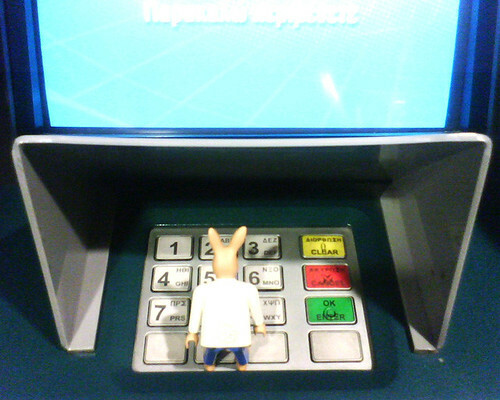 Harriet’s bank called: Her account had been hacked. My debit card was compromised a few days ago. My cell phone rang before 9 am, which seemed odd, so I grabbed it only to hear a recorded message indicating my ATM card had been cancelled. It said I should check my account to see if there was any unusual activity and then go to my branch in person with two pieces of ID to get my account sorted out and obtain a new debit card. I immediately fired up my netbook to check my bank account while my toddler took it upon himself to tear the place apart by climbing on the table, grabbing pens and attempting to get at my keyboard – not ideal when engaging in online banking. I sat him in his highchair with a bowl of applesauce so I could take care of business. A quick review of my account revealed a $360 withdrawal from an ATM in Surrey, a suburb about 45 minutes from Vancouver. I haven’t been to Surrey since I worked there about seven years ago so I knew it wasn’t me. Cue a minor panic attack. I then remembered that my card had been cancelled so I had no reason to worry about further charges. Still I had a paycheque to deposit and I was worried about getting back the $360. I needed to go to the bank pronto. One slight problem: my son is at the age where he cannot go to a bank. At 16-months-old, he’s a nonverbal whirlwind of activity simultaneously charming and dangerous. I told my neighbor the situation, and she graciously took him off my hands for an hour while I hightailed it to the bank. I had to fill out some forms, sign that I had not withdrawn the $360, and the teller set a reimbursement to my account in motion. She then set me up with a new debit card. The process was straightforward and took about half an hour. Money coaches comment: Drawing on my time in the banking industry, this is a common experience. Naturally people want to know which merchant had a compromised machine. Usually the bankers themselves don’t know; the police don’t tell them. For one thing, often the merchant is a victim too (in that they had no clue their machines had been tampered with) and also, sometimes the police still want to catch the criminals so don’t want to give any indication that they’re onto the situation. Regarding how to prevent it, I never use my card at a machine that is unattended, eg. at the gas pump. Unattended machines give opportunity for the criminals to insert their readers into the machine. Readers, my understanding is that all (Cdn) banks will reimburse you if money is taken from your account, provided that a) you have never disclosed your PIN to anyone and that b) you sign affidavits. Have you ever heard of anyone not being refunded?